A human lies with eyes open, in a bedroom, a vacuum, walls and floors lined with the most light absorbent material, the blackest black, retinas replaced with the retinas of a frog. In the center of the long dark room is a barrier, a wall with two slits cut in it. At one end, opposite the para-human, beyond the barrier, is a light source. Bars of light and bars of the absence of light—shadows cast through the two slits—collect in alternating soft stripes on the wall behind the human, brightest in the center and progressively dimmer as they repeat out to the edges. The bedroom is stretched to one hundred million kilometers long. The light’s intensity is greatest near its source. 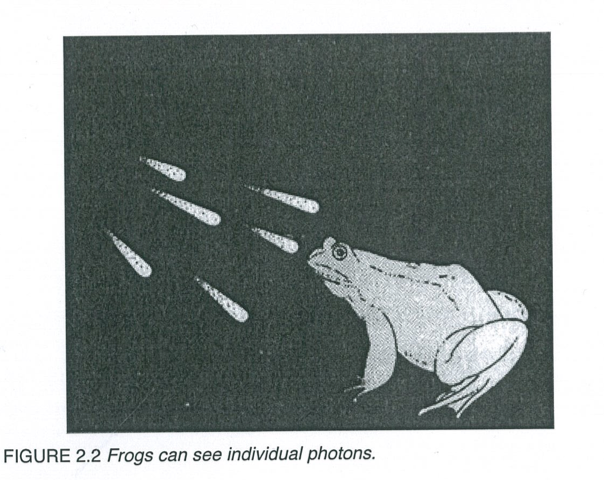 Here, photons are the most densely packed together, but at the other end of the room, the space between the billions of photons emitted has grown so big that they can be individually perceived as flickering blips by the frog retinae. To a human without these amphibian eyes, it would appear to be dark. A button is pressed. The bedroom is bedroom-sized again. The wall behind the human, with stripes of light and shadow cast on it, opens to reveal a photomultiplier (PMT), a phototube light detector much more sensitive than a frog retina. The light is dimmed and a green filter is placed in front causing the rate of green photons passing through to drop dramatically. Though the PMT detects millions of photon events per second, it can tell that only one photon at a time is in the chamber. Peering at the millions of blips accumulating in dotted stripes on the PMT, the homo-anura ponders why, when individual photons pass through the two slits, they do not agglomerate in two lines. There is no such thing as individual. She slumps over in a wash of red dots. The standing world becomes the lying down world. With eyes closed the augmented human sees shadow photons—those invisible partners of the palpable photons that must be passing through the opposite slit and colliding with the visible photons before they hit the PMT, thus causing even lone energy particles to accumulate as an interference pattern on the glass of the photomultiplier. And those invisible photons exist in a parallel invisible universe that the human now sees. It is therefore the lying down world, through the mind's frog eye, that offers passage to the plural universe: the pluriverse. Lying down separates me from the standing world. The standing world is a functional, logical, laborious, and violent world. The lying down world is a contradictory one, with both intimate pain and comfort. It's a submissive world, especially when meeting someone from the standing word. When taking part in the standing world and a feeling from the lying down world begins to creep in, the desire to join the lying down world becomes irresistible. I came across this term in Donna Haraway’s writing on String Fabulation. Her ideas and writing have been an inspiring source for my own.